Every once in a while my enthusiasm for running ebbs a bit. I'd guess that most runners experience peaks and valleys over the years but sticking with it is the thing that defines us. I am doing better these days in terms of stamina, but, right now, I view running mostly as a means to retaining fitness. I'm not detached from it, but I don't think about it as often as I usually do. I know my enthusiasm will eventually return. Even so, I am getting my workouts in. Friday I ran around the neighborhood before my workday started, covering my usual 5K route under very humid conditions. I'd hoped to defray some of the heat by getting out early enough to avoid direct sunlight. Unfortunately, the sun had other plans and it ended up being a hot and soggy run. 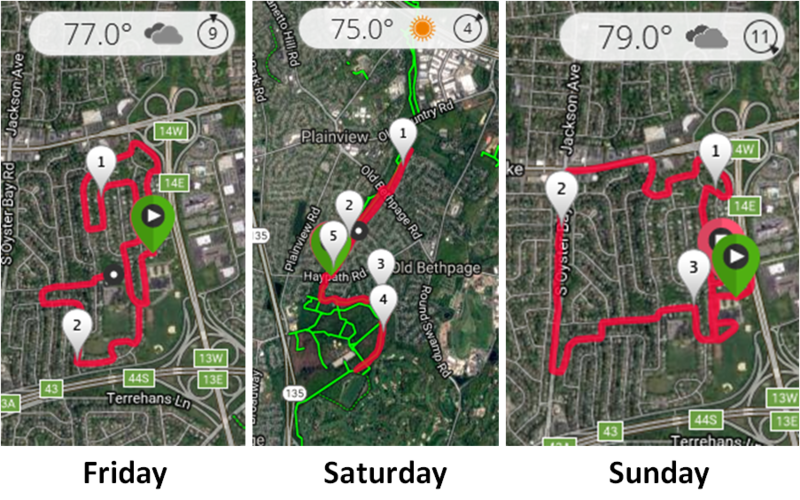 Yesterday I headed over to Bethpage to run the bike trail. I started about 8:00 AM which was probably two hours later than I should have gone out. Running in shade made it bearable. I've minimized my sugar intake for over a month now. Besides losing ten pounds, I've also come to expect easier runs. For the most part I have, most noticeably in the way I feel at the beginning (no more starting struggles) and at the end (plenty in the tank for finishing fast). Yesterday, that was the case, except when I had the dual displeasure of dealing with big hills and baking sun. At one point in yesterday's run, I was coming down past the water fountain south of Haypath when two guys started calling to me. As I got closer I heard one of them say, "Is that Greg? We thought you were our friend Greg." I said, "No, but I'll bet he's a good looking guy!" (yes they laughed). Later on, after I'd turned around at Bethpage Park, I saw a guy who was dressed like me: white hat, sunglasses, reddish running shirt and gray shorts. I wanted to yell, "Hi Greg!" but I didn't want to freak him out. This morning I managed to get out a little earlier because I wanted to be back in time to watch the start of the Olympic men's marathon. I was really happy to see Galen Rupp get the bronze, but disappointed for Meb who had an issue mid race that put him far back in the field. The other American, Jared Ward, finished 6th. Go USA! 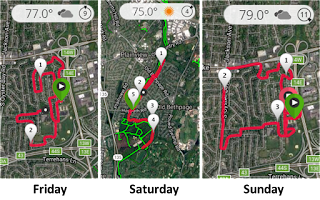 I stuck close to home for today's run, and changed up my usual route. I was coming down the hill on Jericho, past a Starbucks, when I saw a guy walking out to his car eating a bag of chips. He looked at me as I went by and said, "You're making me feel guilty for eating this for breakfast." I shouted back, "There's no bad time to eat potato chips." I'm such a wit. I ended up covering 3.4 miles, a little more than I planned. I was also extremely lucky because the moment I finished my run, the skies opened up to a downpour. Like my prior two runs, I didn't know my distance until I'd finished. That's because I have to stow my Garmin in my SPIbelt due to the broken strap. As much as I'd like to continue to run with the FR210, it's impractical. I need to decide whether to replace it with a new Garmin or look at models from the numerous competitors that have come into the market with reasonably priced GPS watches since I bought mine in 2010. We're supposed to get some relief from the humidity next week and I would welcome that greatly. Perhaps the cooler, pre-fall weather will restore my enthusiasm for all things running. I wish I were running as much as you.. and you and SIOR are two of the wittiest people I know. You sure seem to be getting out, and getting fast on all those B+ rides. Thanks for saying I'm witty. I guess SIOR is witty for a vegan.